I hate working under a sink. The older I get the less willing I am to deal with plumbing. But I also hate having to pay a plumber… It’s time to rethink this. If you think of plumbing as your rental’s digestive track, then a lot of things start to make sense. Just like with your body, when it comes to a blockage, you’d much prefer a chemical remedy over a physical one. …And the more natural the remedy, the better! Drano has been around for years. It’s effective but too caustic for me. I don’t want to take any chances with my 1965 galvanized pipes. Re-piping would be crazy expensive. So it’s not worth the risk. Plus my wastewater engineering background won’t allow me, in good conscious, to send those synthetic chemicals into our water ways. I like the new biodegradable remedies that break down soap scum, hair and grease. The brand I’ve experimented with, Green Gobbler, works great. 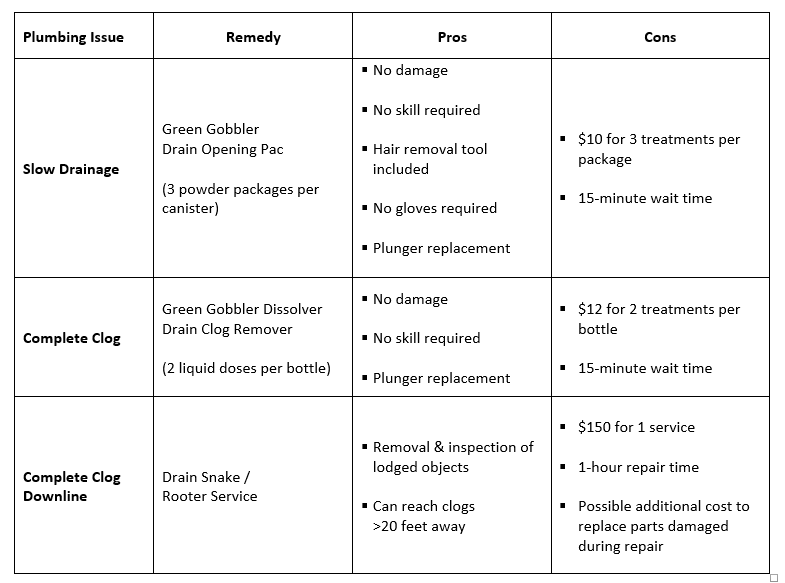 The following table summarizes my new approach to fixing plumbing problems. The table shows the progression. It now makes sense to pour in a biodegradable drain opener product BEFORE you reach for a plunger. Since chemicals break up the clog instead of pushing it downline, in my mind, they are better than an icky plunger. And from a cost versus time stand point, they are better as well. That should correct most problems. You may never need to call a plumber again! Stage 2 – If powder didn’t work, use the Green Gobbler Dissolver. You can (or your tenant can) pour the environmentally-friendly solution into the drain. The Green Gobbler Resolve is heavier than water so it makes its way down to the clog. Then, as in Stage 1, you want to wait 15 minutes, then flush with hot water. 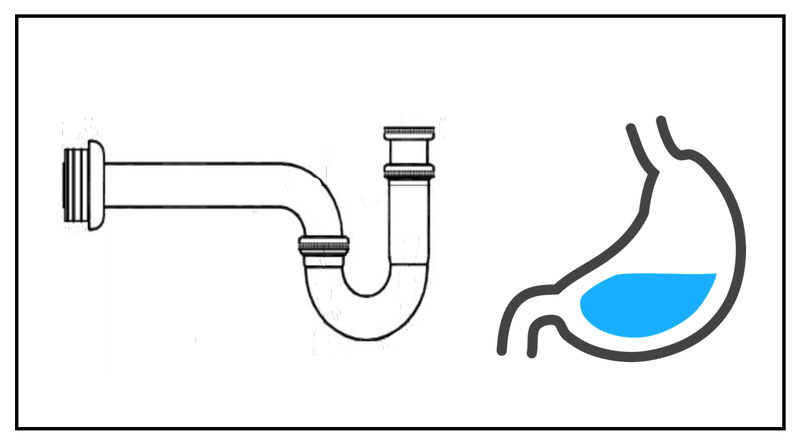 Stage 3 – If the first two steps don’t work, then go get a plunger or drain snake. The Green Gobbler Drain Opener comes with 3 “pacs” and a hair removal tool. See the picture of the shower drain below? I placed a bottle to mark the edge of the puddle that formed after 30 seconds of running water in the shower . The red line outlines the water that pooled before treatment. My wife was complaining about the slow drain. She could feel her feet being covered with water while showering. I naturally had to do something. I poured the Green Gobbler Drain Opener powder into the drain, waited 15 minutes, and flushed with hot water. 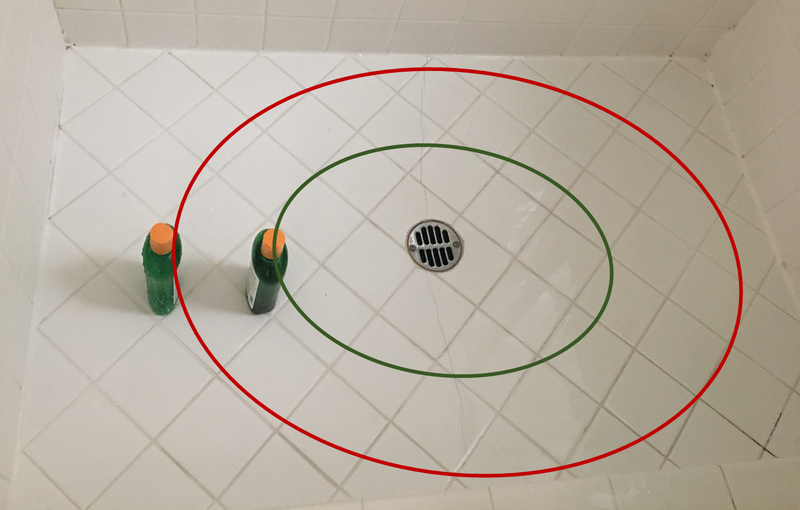 The green outline marks the post-treatment pool that resulted after 30 seconds of the shower running. After one treatment, the drain was flowing freely again and my wife is happy. The powder Green Gobbler Drain Opener worked as advertised. My tenant called to say her kitchen sink was clogged. This gave me the perfect opportunity to test the Green Gobbler Dissolve! We poured in the solution, waited 15 minutes, and flushed with some boiling hot water. Boom… the clog was gone! The Dissolve is heavier than water so it settles to the bottom and makes its way to the clog. I didn’t need to get under the sink and disassemble the P- Trap, with water dripping on my face as I fumble with a flashlight. I didn’t need to get bowls and towels out to catch all the nasty water that spills out of the trap. No cleanup time required! I didn’t break any fixtures while removing or re-installing the plumbing. I didn’t have to remove everything under the sink and put it back after the work was done. 1 – Plungers push the clog further down line. These environmentally-friendly chemicals break up the clog and remove soap scum. That’s why I recommend they be used first. 2 – Since these biodegradable products are non-toxic, you can make them available to your tenants. Allow your tenants to self-service their sinks and drains. This could prevent larger problems from arising. 3 – Most of my maintenance issues involve hair in the bath tub and bathroom sink drains. I used to fix these things with a drain snake. I’m done with that. Drain snakes do a good job but there’s always a mess afterwards. Plus I have to clean off the snake which is my least favorite thing. Even with strainers to catch hair in my tub drains, I somehow still end up snaking. All of that is over now! 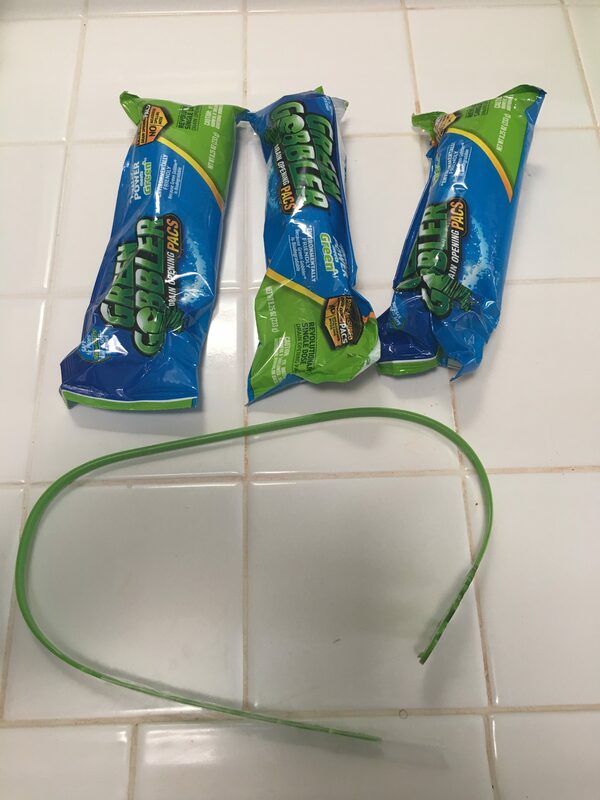 And, when you can get three packages of the powder Green Gobbler Drain Opener for less than $10, it doesn’t make sense to spend the time and hassle snaking a drain. In fact, it doesn’t make sense for me to leave my home to do something my tenants will happily and easily do for themselves. From now on, I’m leaving a canister of Green Gobber and a set of instructions at all of rental units. If you like this article and want more ideas that will help you create and save $1,000s, each and every year, then check out this resource. NOTE: All product links are affiliate links. 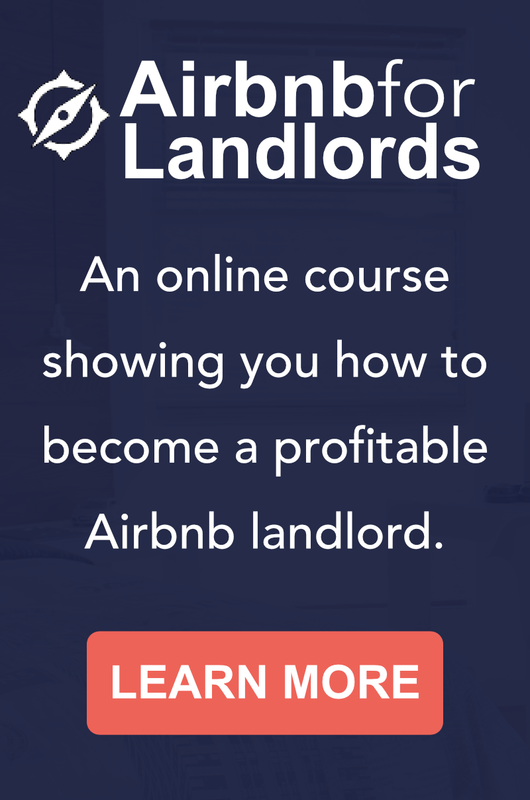 If you use them to purchase a product, then you’ll be funding the Landlord Science Department. Your contributions are poured back into research. Thank you for your support. 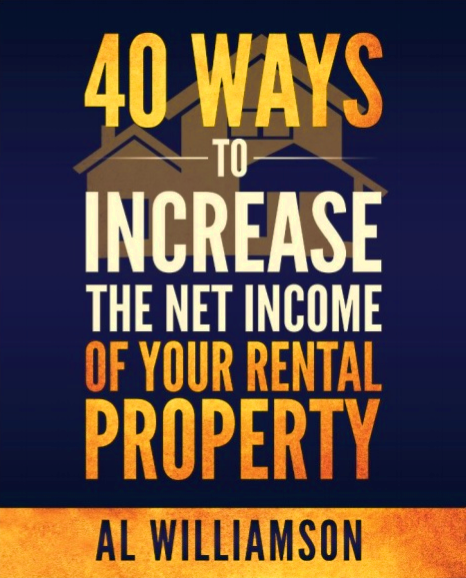 Nice article Al – like the tips. I personally like the Liquid Heat (powder formula) usually unclogs most slow to stopped drains. I find in the bathroom, the sink and tub use the same line so clear both at the same time. I find if it’s a stubborn drain I use a foaming agent first then the powder Heat product from HD. Does it works in grease in the kitchen sink? I haven’t tried it but the company claims that it does. 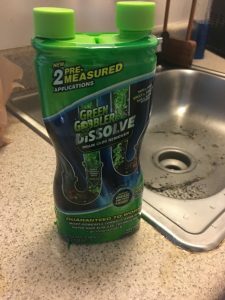 I did try the Dissolve product in the kitchen sink and I was very impressed. It’s only $12 – nothing to loose.